Place every­thing in a food proces­sor and process to a creamy con­sis­tency. 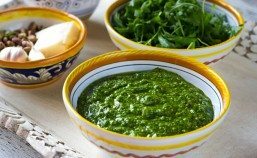 Use the same way you would basil pesto, on pasta, fish, bread, etc. Yields 1 cup.